Days this benevolent are rare and hard to find. Today is a good day to “take off” not because you need to hide or clean house but just because it is likely to be “fun” for most people. We need those kinds of days every so often. If you must work, you will tend to “get things done” and may have some insights. One warning: Chiron opposes Hygeia, and this puncuates that you MUST take care of certain health issues. Do it. Mars Novile Pluto brings important lessons (especially for police and intelligent agents and any similar Martians), and Mercury Novile Neptune brings the same “poets, priests, and politicians” (who, as Sting pointed out, “have words to thank for their positions“). Saturn BiQuintile Vesta insists that we take a look at our traditions and “why we do them.” Some things need to stay and others need to go. By today you should have some idea what those are and should act on them accordingly. 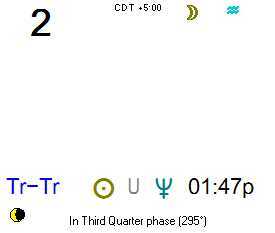 Moon (Capricorn) squares Sun (Aries) and fourth quarter begins. The next week of cleaning out begins in earnest although some acquisitions can be had since sellers will tend to have an advantage over buyers. Try to stick with practical purchases and the Moon will favor you. Mercury conjoins Uranus and brings surprises and possibly powerful insights. This is a great day for writers and communicators and similar creatives that work with words and messages. However, transportation “surprises” (problems) can occur also. 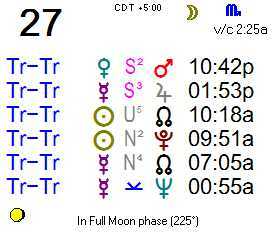 Moon trines Jupiter (Virgo) and joins Pluto (Capricorn) in the latter part of the day (which tends to mostly feel benevolent if sometimes a bit too serious). Vesta quadrinoviles the North Node (Karma, “Rahu” in Vedic astrology) and you can learn an important insight, lesson, or skill by examining your traditions (or the traditions of others) and how they are performed. As is true with all quadrinoviles, the insight or skill may seem trivial at the time and you may not notice it or pass it by unless you make the effort to capture it and own it. But, in the future, it will prove to be important. This could be true as early as tomorrow, after you have “slept on it,” and a Saturn BiQuintile (power insights, sometimes genius level) opens another window (which may require you to give up or let go of something to progress). 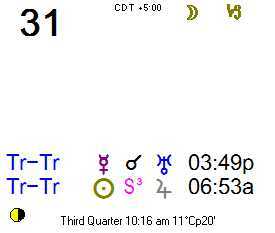 Moon remains void (v/c) in Sagittarius until it enters Capricorn at 12:45 PM CDT. Today is very busy, and you will feel it. Venus conjoins Chiron during the lunar void, and you will feel the need to “do something” about health (or education) needs. You can act, but realize that you will likely need some kind of “do over” or adjustment after the Moon enters Capricorn. Mercury squares Pluto, and some rather nasty power struggles can emerge. If you are aware of a “situation” that is “brewing” then prepare for it. Sun / Neptune adds a hazy feel to the day at times and the possibility of being swindled. In the evening all of this can be channeled into creative works as long as they tend to have a practical “grounded” quality to them. If you focus yourself, you can accomplish much today. Obstacles and snags will be present, but it will worthwhile to pay attention to details and avoid any puffery that presents itself. 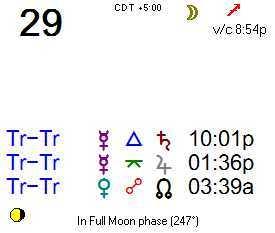 Stick to the facts, and complete everything before the Moon turns void (v/c) at 8:56 PM CDT. Mercury Trine Saturn favors progress if you are a Fire or Air sign. Earth / Water do better with this aspect in general, but Fire / Air have the advantage today. Mercury quincunx Jupiter says puffery (“Salesmanship,” BS, etc.) is present; avoid it. Venus opposite North Node (and conjunct South Node) tempts us to “take the easy way out.” Do not do that. Moon enters Sagittarius 1:47 AM CDT and remains active until it turns void when Moon squares Venus tomorrow night at 8:56 PM CDT. 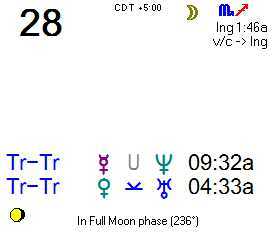 Moon is void (v/c) all day in the sign of Scorpio. Use this day as down time / post-processing from the powerful events of yesterday and the week that preceded it. Numerous higher order aspects are in play. Mercury / Neptune tells us this could be a good day for writing photography, videography or other similar efforts. 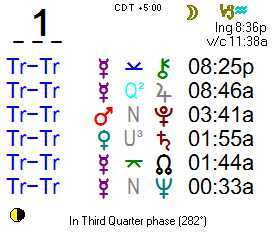 Moon v/c tells us that a “do-over” may be needed, but the initial effort will be worthwhile. Mercury Quadrinovile the North Node tells us you may receive an insight or learn an important skill for dealing with some kind of karma in the future. Make notes about what you learn. 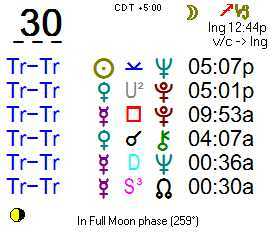 Sun is Binovile Pluto, and that confirms that insights can be had today. Vesta Sesquiquadrate Hygeia gives us some sense of urgency about health and healthcare and “how we have always done things.” Use those insights from the quadrinoviles to solve this problem.